Ask 100 different people what the most dreaded insect infestation is in Florida and you’ll get a resounding answer of “the palmetto bug”. The palmetto bug, also known as the water bug, is a species of bug that can be found all over Florida. The answer is usually – they are the same thing. There are several species of cockroaches that are routinely called the palmetto bug, but the most commonly identified palmetto bug is also known as the American cockroach. The Florida Woods cockroach is another one that is also called the palmetto bug. Another name routinely used for these larger cockroaches is the water bug. So basically, if someone says they’ve seen a water bug, a palmetto bug or a cockroach, they may be talking about the same type of bug. However, without getting professional identification, it may be hard to tell for sure. These bugs look like regular cockroaches, but one that’s been feasting on steroids. They can grow up to two inches long, can fly and emit a foul smell. They are also very hard to kill. Just stepping on one generally won’t kill it. How do I tell if I have a Palmetto bug problem? If you see a palmetto bug outside every once in awhile, that’s just part of living in Florida. But if you start to see these bugs every day, then you’ve probably got some type of infestation. 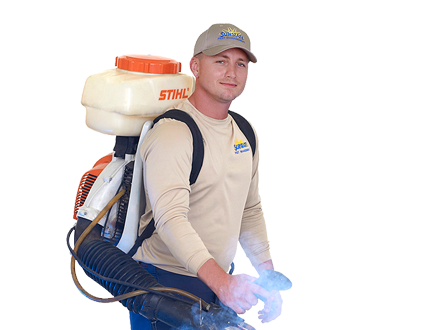 Living in a tropical climate like we do, which is perfect conditions for roaches to thrive, it’s extremely difficult to completely get rid of Palmetto bugs. What to do about your palmetto bugs! * Fix leaky faucets and drains. * Keep the backyard clean and free of debris. * Do not keep food out overnight. This includes pet food. Store these items in airtight containers. * Keep a clean, clutter-free house. * When bringing items into the house, it’s important to thoroughly check through them to make sure a palmetto bug isn’t hiding anywhere. * Fix holes or entry ways by using caulk or tightly-fit screens. * Make sure doors and windows fit tightly. Even the best prevention methods may not keep the palmetto bugs away. Most homeowners will contact a professional for assistance in treating the home and yard for these bugs.